Anyone have any pictures or autographs to share? I met him at SuperMega Fest in Boston a couple of years ago. I got a pro op with him sitting in front of a "Bandit" style Trans Am. Right when it's time for my photo, the photographer has an issue with the camera, and his to fix something, so I get a couple of minutes to talk to Burt. He makes small talk, asks me where I'm from, etc. When I told him I drove from NJ to meet him, he squeezed my arm, and told me how he appreciated it. I pointed to the line for the photo, and told him that a lot of people traveled to meet him. He spoke about playing football in the area when he was younger, and his early films, remarked that "I can't believe so many people still remember me around here". Right as the photographer was fixing the camera, Burt asked me "So, do you have a wife and kids back in New Jersey?" I told him that I was single. He gave me a wink of the eye, and said "smart choice". Another wrestlemania celebrity and actually a real wrestling fan from what I heard, especially of Freddie Blassie. I wish I could have met him, I enjoyed a lot of his movies. I know he was a major star but I feel like he may not have really gotten the appreciation he deserved. He did one of those 1980s game shows with Dom DeLuise and Burt Convey (I think Burt Reynolds may have been the producer) so he didn't take himself so seriously and put himself over as a major star. It's good to know he was fan friendly at these autograph shows considering some of the more miserable older stars who do the convention scene. I'm sure with some of his financial hardships over the last few years, he really did appreciate those who came to meet him. Wizard Philly 2015. I am a huge Burt fan, have been forever. Smokey, Stroker, and Cannonball I LOVED as a kid. Fast cars, goofy jokes, what's not to love? Later I found his earlier films like Deliverance, Longest Yard, or Gator, they were terrific. Then came along Boogie Nights, also amazing. 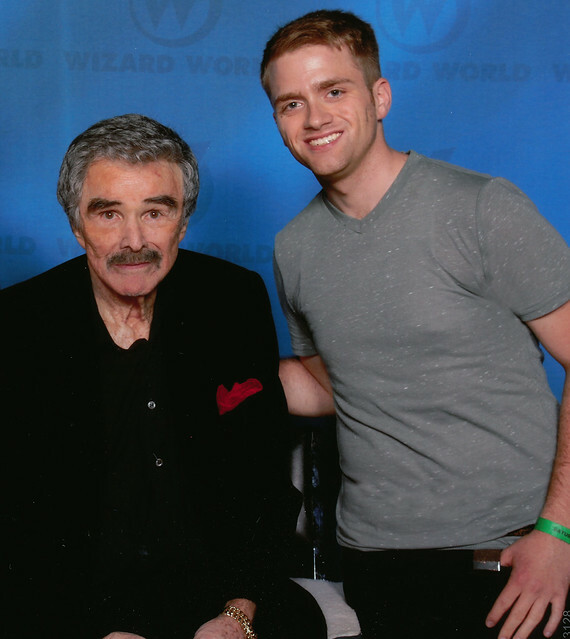 Here's my pic with Burt from Steel City Con last August. This is the best Burt fan photo I've seen from his convention rounds. This family was behind me in the Burt Line at Steel City Con. Their pic turned out to be a classic, and proves once again that Burt was full of fun, and loved meeting the fans.